An unknown enemy wreaks havoc in the South China Sea while blaming the destruction on Jonah Blackwell and the crew of the Scorpion, forcing them to untangle a deadly conspiracy rooted in a lost technology from World War II. May 6, 1945: A German submarine U-3531 disappears en route to mainland Japan, taking with her a weapon that could have changed the course of the war. Present day: Salvage diver turned submarine captain Jonah Blackwell and his unproven crew resurface on a mission of mercy, secreting starving refugees from the brutal North Korean regime as a hundred-year winter ravages the northern Pacific. Hunted by the Japanese fleet and forced to surrender, the crew of the Scorpion are blackmailed into investigating a mysteriously quarantined DPRK submarine base. As chaos erupts across the East China Sea, the crew of the Scorpion find themselves embroiled in a conspiracy that threatens to reshape the entire region. Now his crew must race against time in an adventure spanning the irradiated waters of Fukushima, flood-beset Tokyo metropolis and the crumbling tropical remains of a secret Japanese research facility. At the center of it all is an enigmatic technology cult with roots in the clandestine weapons program of the Second World War—a cult that has waited seventy years to strike its final blow. 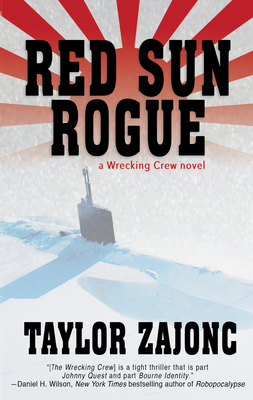 As a maritime historian and shipwreck expert, Taylor's real-life adventures parallel those of his fictional counterparts. In addition to personally setting a deep-ocean depth record, his archival field research contributed to the discovery of some of the most incredible treasure shipwrecks in history, including a 110-ton trove of sunken World War II silver. He is a member of the famous Explorers Club; a former researcher for Odyssey Marine Exploration, a treasure-hunting company whose activities were featured on the Discovery Channel television show "Treasure Quest" as well as a number of specials. He is also the Research Director for Endurance Exploration Group, which is expecting a substantial amount of media attention on their major projects this year; and also has the distinction of being a part of the first Titanic expedition to be accompanied by a marine archaeologist.